The latest news out of Greece is truly a head scratcher. After agreeing with the Eurozone to a four month extension, the new plan to get them from here to there can only be described as insane. In order to roll over current debt, Greece plans to “borrow” from public pensions! They had a T-bill auction yesterday which was supported by funds from their public retirement fund, the method employed was comical. What Greece has decided to do is to pledge securities into the “repo” market to raise cash, this cash is then used to bid at auction …the new funds then are used to pay down past debt. Do you see how this works? As a graduate of the venerable University of MCV (University of My Cousin Vinny), I will try to explain it to you on street level terms. While business is good, you live a little better than what your income would provide. You do this with confidence because each year has been at least as good if not better than the year before, so living a little large and adding debt to your balance sheet is not a great concern. Then you start living even further beyond your means. As time passes, the leader of the local gangs asks you if your gang would like to join? Of course you want be part of this well known and prestigious group of gangs but one of the preconditions is your business must be good. It doesn’t matter what your businesses are, what does matter is you can make money and not be a drag on the other gangs. Knowing that you already owe some out of town loan sharks what do you do? First off you hire Golden Suks to help you with some creative accounting and enter into a few contracts with them so you have something to show when you open the books for your entry audit. “Sure we owe Clive down the street but Guido owes us and will pay Clive directly if his interest rate starts to rise, so it’s all good!”. This is where it gets interesting, you are accepted in as one of the gangs but business begins to slow and even your crew starts holding back on you. Normally you get a 25% “tribute” on anything they steal or conjure up, but now, even on deals you find out about you aren’t getting what you used to. This is a problem, a BIG one! You see, while living above your means you had to keep borrowing more from your loan shark. He never really pushed you and was willing to let you just pay interest because you had always paid on time. This begins to change as business slows, now your source of cash became less willing to lend. What do you do? Simple, you decide to go to other loan sharks and take on more loans because as the saying goes, “you only live once and you might as well have fun doing it”. This of course is akin to normal people paying off one credit card with another but it’s OK as long as you can keep borrowing more. Along the way another problem arose, you had to for appearance sake give a monthly stipend to the families of deceased “soldier’s”. You did this out of cash flow and even gave some of them cars and houses. You don’t want to kick out the spouses and children of those who had provided for you so you go to the local pawn shop with deeds and titles. The pawn shop gives you some cash and the families still get to use the cars and houses, problem solved! Then the problems really begin, the other bosses just so happened to have a meeting at a resort where three or four of your loan sharks were vacationing. Your name came up and each one found out you were in debt to ALL of them. You tried to divert attention but it turned out this news got back to the other bosses, your whole charade then came down. As news normally does, it spread like wildfire. Everybody knew you were broke which lead to other consequences. Even your own gang was rebelling and the tribute money dried up to a trickle. It was a good run but now it’s over. Enough parody, what Greece is doing now by borrowing against unencumbered (though probably worthless) pension treasury securities is ridiculous. If this is their plan, the people will riot further, run their banks until they all close and destroy the country. They are pledging pension assets to raise cash …and are using this cash to bid for their own bonds. They must issue new bonds in order to pay for maturing old bonds! What will happen when they need to actually make the repo payment in order to get the pension assets back? Where will this money come from? And when they can’t come up with the money, even their retirement plan becomes unfunded. I do want to make another obvious point, what good will Greek treasuries be to the new holders who lent money against them to begin with? What could possibly go wrong? As I have said many times before, “broke is broke” and cannot be solved with more liquidity which will ultimately need to be paid back. This is the broad systemic problem, liquidity cannot (never could) fix a solvency problem. More liquidity only creates more debt and only buys some time while making the overall problem larger and larger. At some point in time, the money either gets paid back or “bankruptcy” is admitted. Before finishing I would like to make one other point. 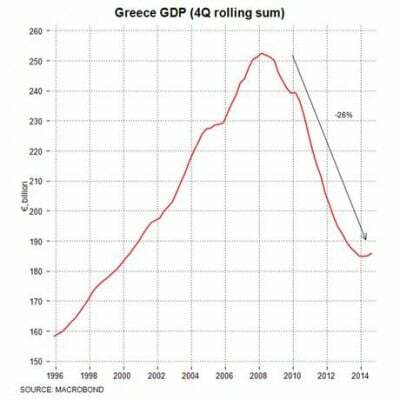 Greece is no different than the EU itself, the U.S., the IMF, Britain or any other Western fiat Ponzi. The only difference is that Greece got “caught” first and did not have the ability to print their own money. While “printing” has allowed the fraud(s) to be covered up and smoothed over, sooner or later the debt must be paid back…and this is the game. The debt cannot be paid back and never was expected to really be paid back, rolling debt over and over and over was the plan. The funniest thing to me is all of this supposedly is “already in the market”. In other words, all of this is “priced in”! At a time where “risk” of all sorts has never been higher, there is virtually zero premium for any risk. In the simplest of terms, we live in a world gone mad! No one looked to the end game because it was so much fun while playing the game. I have no idea what the “event” will be but please remember this, huge forest fires all begin with one thing in common, a very small spark or something to ignite it. They all start small and all grow out of control. This, is the collective global monetary system we live with and why so many nations are preparing to exit the game.